IgA nephropathy (IgAN) is one of the most common recurrent glomerulonephritis after renal transplantation. Rarely, it is accompanied with the presence of crescents that leads to rapid deterioration of renal function and graft loss. We present a 54-year-old patient with IgAN that received a cadaveric kidney allograft, but developed biopsy proven recurrent IgAN 7 months after renal transplantation. He was treated with intravenous steroids and angiotensin-converting enzyme inhibitor and remission was achieved. 4 years later, he presented again with heavy proteinuria, hematuria and deterioration of renal function. Allograft biopsy revealed recurrent IgAN with crescents, which was successfully treated with pulse intravenous steroids and six monthly doses of intravenous cyclophosphamide. This regime resulted in long-term sustained remission with a stable functioning graft 3 years later. 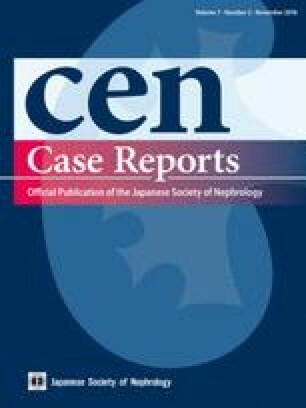 Although it is not an established treatment as in native kidneys, intravenous cyclophosphamide should probably be considered in kidney transplants with potentially reversible recurrent crescentic IgAN.